So two things I am. A hopeless romantic and a lover of Asian dramas. Kdramas, Jdramas, Cdramas, etc…. I subscribe to Dramafever, a website that is basically hulu/netflix for international tv. And I like watching the period pieces as much as the modern day ones. The costumes in the period pieces are just so captivating at times. 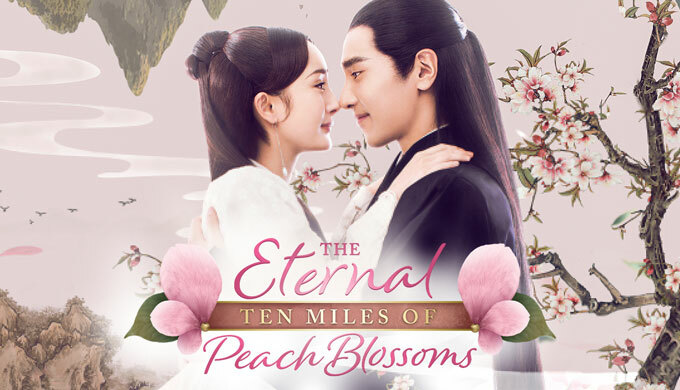 Right now I am watching a drama series called 10 Miles of Peach Blossoms. 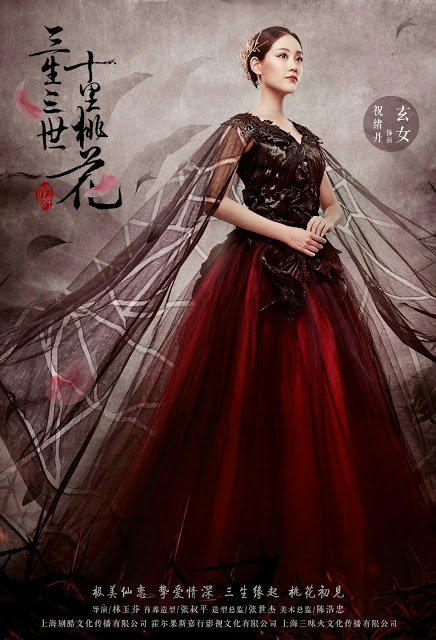 It is a beautiful romance about the immortals from Chinese folklore. And the costumes are so beautiful and intricate. Some of them seem so simple but they are far from it. Then others are so elaborate with embroidery and sequins. Ahh, I just look at them and want to aspire to that level of technique. It just motivates me to work. So I have some pictures for you. These are pictures from the production and I am in no way taking credit for them. They show the costumes in great detail and that’s what I wanted to share. 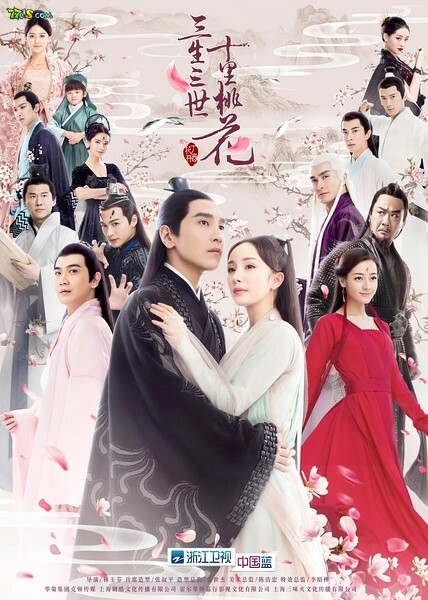 So hopefully you all will want to go watch this drama for yourselves. This first photo showcases many of the main characters and you can see their costumes, but not as well as in the other pictures. 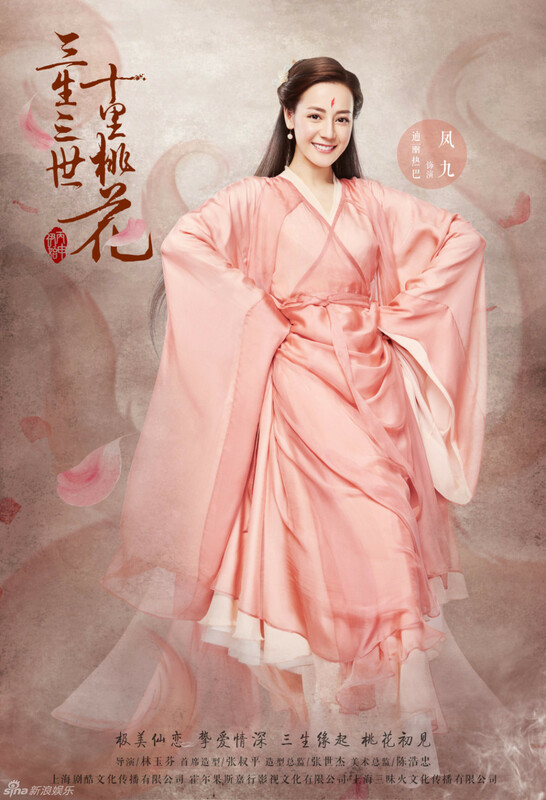 This next picture is of the main heroine Bai Qian/Si Yin/Su Su. She play one character that has three different identities. 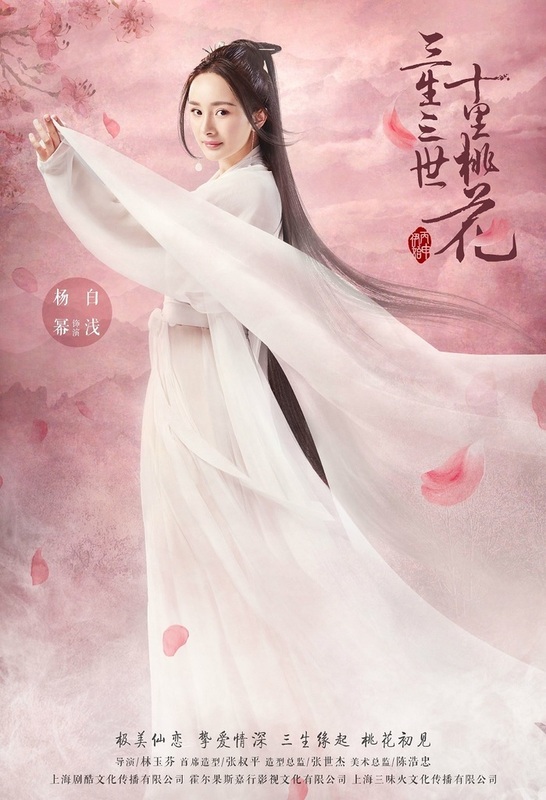 She is the Nine-Tailed Fox Queen of Qing Qiu. Now the type of costume each character wears depends on which clan they are from. 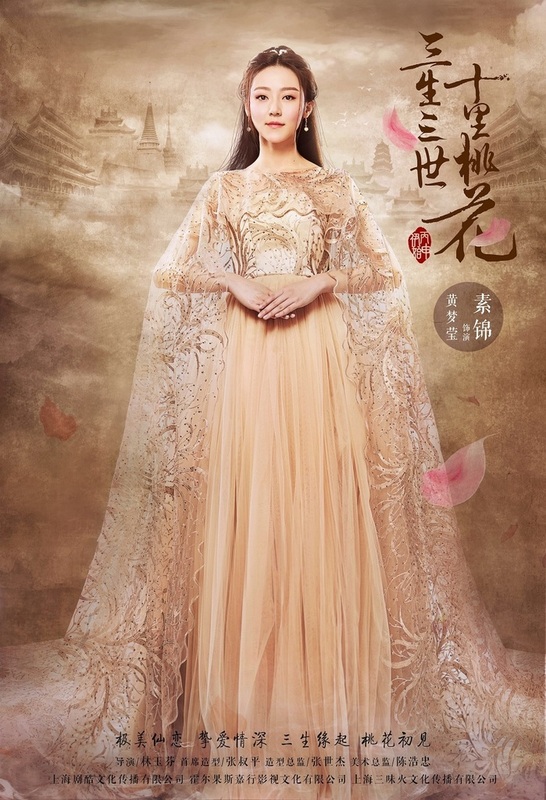 Bai Qian costumes look simple in comparison to some, but that is deceiving because if you look closely you can see that they are combined of very intricate drapery. It is draped so well that when the fabric moves it seems as light as air, as liquid as water, and as find as gossamer wings. The light shines through it and makes it seem like there is nothing there at all. Just beautiful. 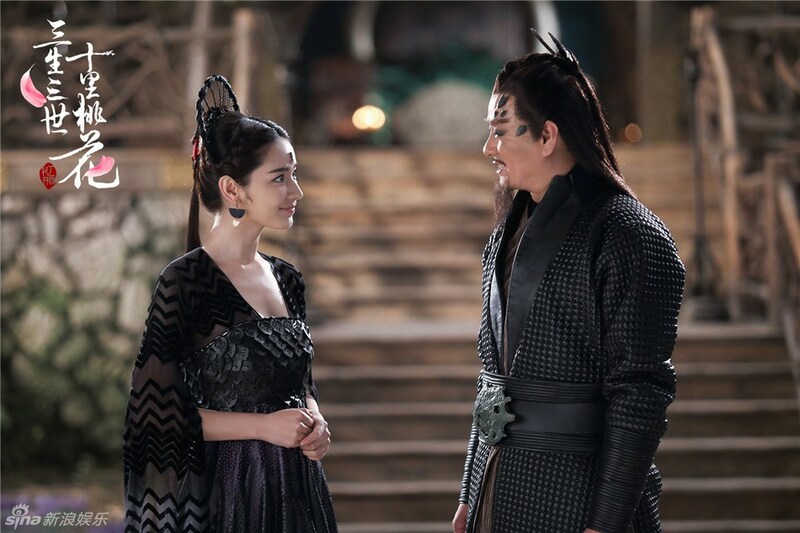 Bai Qian also wears armor early on in the series that is very intricate and heavily adorned. It is just as beautiful in it’s own way and somehow, it doesn’t feel to bulky even though it probably is. 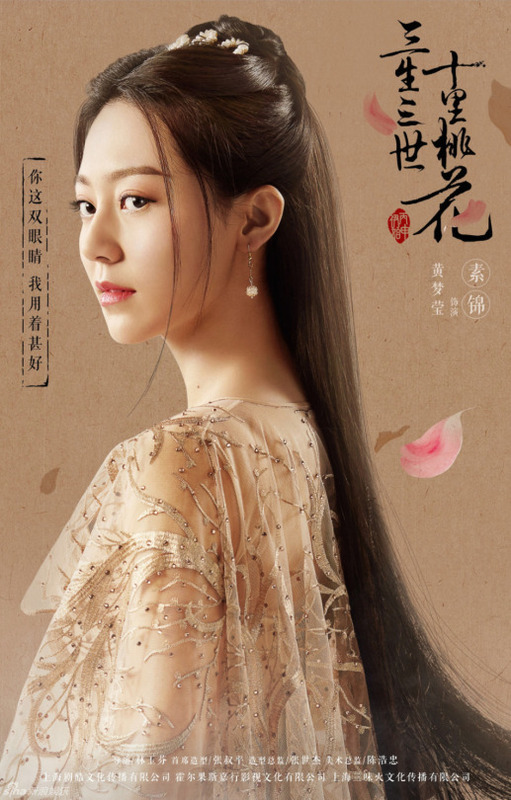 There is also Bai Qian’s niece Feng Jiu. 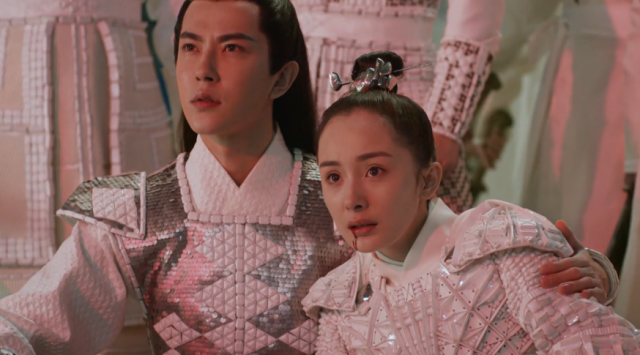 She wears a similar clothing to her Aunt, but the colors are on the warmer side while Bai Qian wear’s more neutrals and cooler colors. 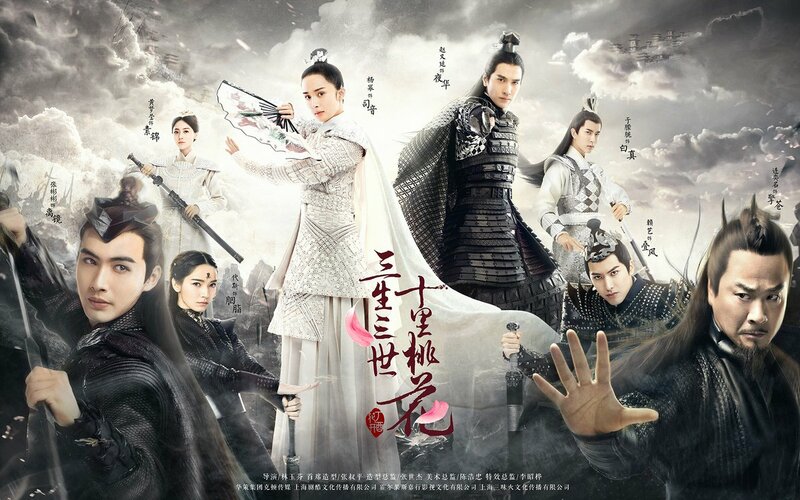 I believe this is because Bai Qian is a white nine-tailed fox and Feng Jiu is a red nine-tailed fox. But no less graceful. Now this next character is known as Su Jin. 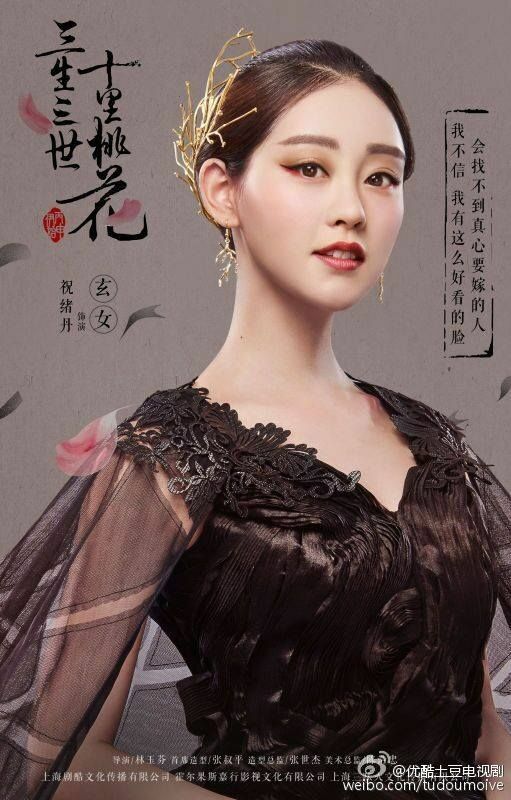 She is basically Bai Qian’s rival in the series. I think she is a B…., but her clothing is gorgeous and I love it! The embroidery on it is so beautiful! I wish I could just touch and study the dress. There were long hours in the work room on these costumes. She is part of the Sky Immortals clan. There dress tends to be more elaborate compared to the Fox clan. They basically rule the heavens, so of course every thing has to be grander. While the Fox clan tends to be more earthy and modest. Then there is the Ghost Tribe. Their costumes are dark and mysterious. Black and red mostly with lots of pleats and lace. It is just as mesmerizing and beautiful. Well I could go on about this drama as well as a lot of others. Perhaps in a future post though, as this one is getting pretty long. Hope I have sparked an interest in you to go and check out this drama. It is a little like watching a soap opera, but on an epic scale with beautiful scenery and a tragic romantic story. I can’t wait to see how it ends. If you are looking for a show that will go on for awhile then this is the one. Over 50 long episodes. But seriously, check it out! If for nothing else, do it for the costumes! Ahh, there were a lot of costumes that I did not cover in this post. Mainly the men, which were just as well done, but I wanted to focus on the pieces and the characters that I was most drawn too.